Very nice part for your TA03. 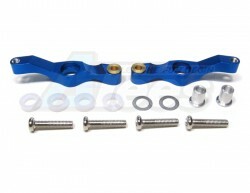 The Tamiya TA03 Aluminum Steering Assembly Set - Blue has an average rating of stars based on 27 customer reviews. The only part with different gold color. Best fit with 5x8x3mm bearing. The only part with different gold, but perfect fit. Suggest to fit with 5x8x3mm bearings. Looks great, gives greater steering angle than factory plastic pieces. A little loose when fully tightened but no big deal.